Adding friends on RipeNearMe grows your network of people who share similar interests in growing and eating fresh, local food. You can see all of your RipeNear.Me friends on your My Friends page. This makes it easy to connect and re-connect. 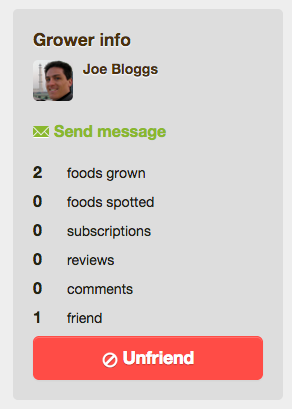 You also get to see what your friends have been up to on your Dashboard - another way to find fantastic local produce. 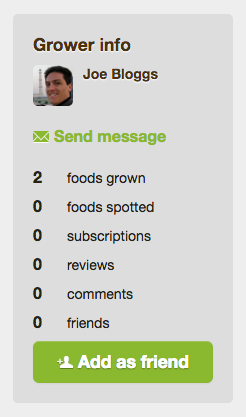 To add a friend on the site, simply select the grower or one of their food items and click the Add as friend button. You have the opportunity to include a message on the as part of the request. Click "send" when you're finished to confirm the request (with or without a text message entered). The user will receive an email to repsond. Once the recipient approves they will be listed on your My Friends page. To remove a friend, view their profile or one of their produce listings. Hover over the Friends button and you'll notice it will change to Unfriend. Click this button, and then confirm on the page that follows. Friends will not be notified when you unfriend them.